A third-year undergraduate course focusing on the biology of birds. Click here to visit the Ornithology course webpage. Note: I will be on sabbatical from July 2019 to June 2020. I may teach this course again in Fall 2020. I do not know if it will be offered, by another instructor in Fall 2019. A second-year undergraduate course focusing on general topics in Ecology. Next offered September to December 2017. Click here to visit the Ecology landing page, which will take you to the course's Blackboard site. Note: This course is expected to be offered next in the winter semester of 2020 by Dr. Pitcher. I may teach this course again in Fall of 2020. An upper-level undergraduate course in tropical ecology, offered as an intensive 14-day field course through the Ontario Universities Program in Field Biology (OUPFB). This course is temporarily on hold, but may be offered again the future. In the mean time, many good field courses are available through the oupfb network. 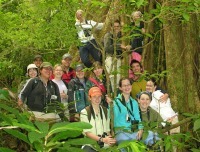 Click here to visit the Tropical Ecology course webpage. Note: If students are interested, I may teach this course in spring of 2021. If you are interested in this, please write to me to express your interest. A graduate course dealing with avian bioacoustics. This course is temporarily on hold, but may be offered again in the future. Click here to visit the course webpage. Note: If graduate students are interested in this course, please write to me... it could be offered in 2020. A graduate course dealing with tools and techniques important for success as a behavioural ecologist, team-taught with Drs. Stephanie Doucet, Oliver Love, and Trevor Pitcher. This course hasn't been offered in recent years, but a new course for all incoming graduate students has taken its place. Follow this link to the hompage of the Ontario Universities Program in Field Biology (OUPFB). This program allows undergraduate students at universities throughout Ontario to take field hands-on courses in field biology. These courses are offered throughout the year, but registration is in January of each year.